Casper dreamed of being a known as a sleep company. While they had expanded into furniture, nap spaces, and dog beds, people still didn’t see them as more than a bed-in-a-box brand. They asked us to think about about products & services that could help them stand out from the category by owning sleep. So we asked ourselves what it would mean to sleep soundly through life, every phase & place. We then created products & services to support ones entire sleep journey. 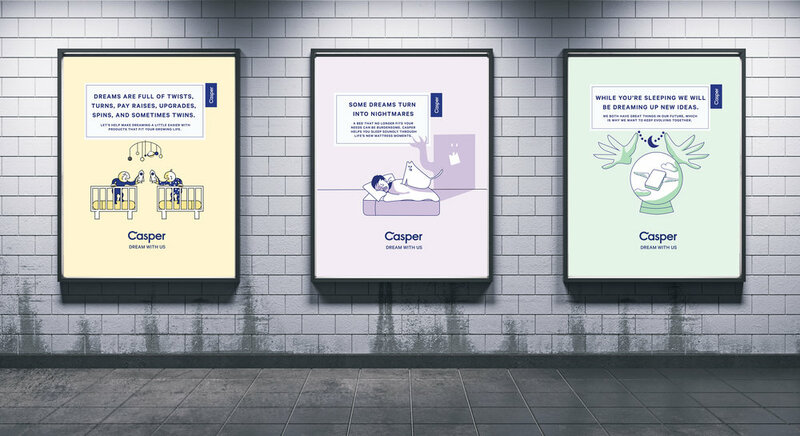 In order to stand out amongst the sea of bed-in-a-box brands, Casper wanted to shift from a mattress company to a sleep company. With 87 hours from brief to pitch, they asked us to dream up products & services that would help them democratize great sleep beyond their box. We started with a competitive audit. Really, we just typed mattress into Google. What we saw was brand after brand promising “the best sleep,” “the perfect comfort,” and “a lifetime guarantee.” They talked about their mattress as if it was the key to great sleep, forever. But, we know that’s not true. Even if a mattress could last forever, its context is never constant. We move across the county, we move in with our significant other, we start a family, we have back surgery… And it’s these moments of mattress transition that keep us up at night. Not only do we have to figure out to do with this very expensive, very large object, we also feel very bad that no one kept it real with us that maybe this thing wasn’t going to last a lifetime. Brands treat mattresses like they’re a final destination, as if you’ll buy it and you’ll sleep soundly forever. In reality though, a mattress is just another stop on the journey to great sleep. See, life is full of new mattress moments that help you dream bigger & sleep sounder but no one tells you that. As a result, those periods of transition are the stuff of nightmares - the guilt of buying a new one, the headache of trying to move one, the scary moment when you realize you’ve had one long enough to see your body imprint… No one had yet thought about sleep across the span of life. 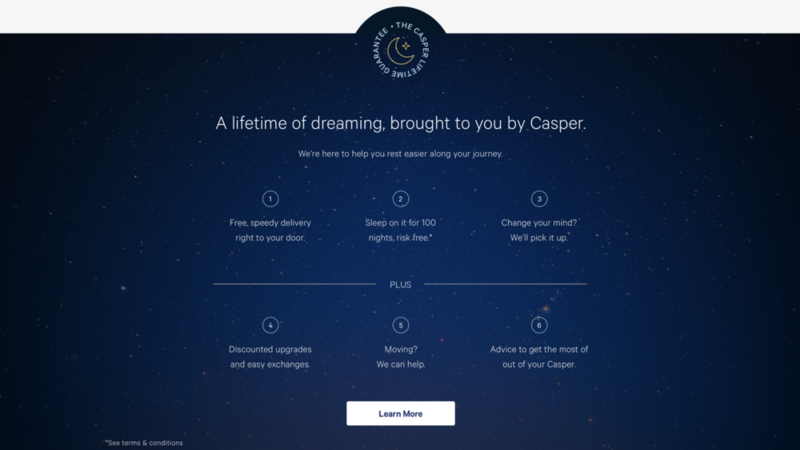 Casper helps you sleep soundly by evolving with your ever-changing life. If we were going to be an end-to-end sleep company, we needed to start our journey together on Day 1. To do that, we created a baby line. We flipped the convention of a lifetime guarantee by promising a lifetime of sleep services instead of a lifelong mattress. We expanded the risk-free trials to include transition support, discounts that grow with nights spent dreaming on a Casper, and proactive guidance to help you get the most out of each stage of your sleep journey. 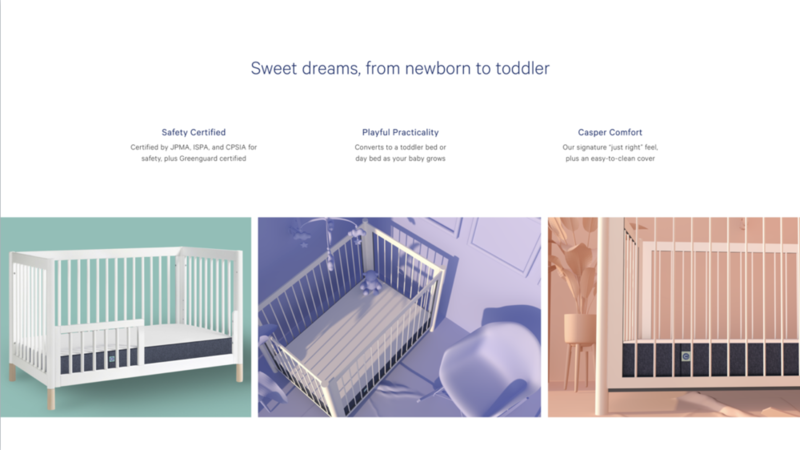 We showed how we could start to bring to life our lifelong sleep journey through our end-to-end products, our transition services, and our internal drive to dream up what’s next.